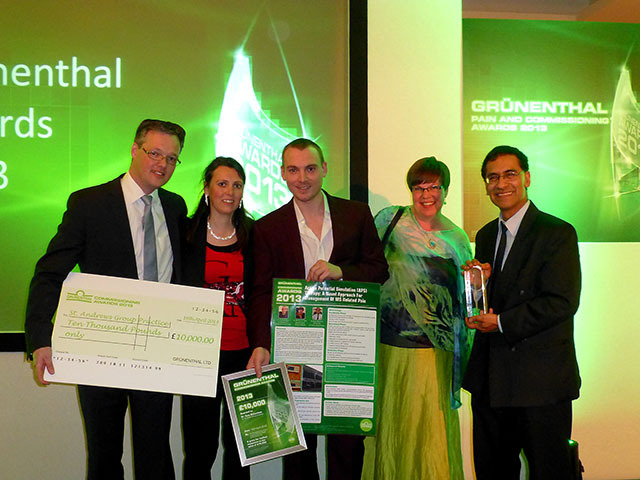 APS Therapy from the Netherlands wins the prestigious Grünenthal Award in 2013 for innovative pain management. Grünenthal invited the members of the board of APS Therapy, Maurice Uytdewilligen and Madelène Uytdewilligen to come to Bournemouth (UK). This beautiful English city at the south coast was the place chosen for the annual Grünenthal Award Ceremony. Grünenthal, a large pharmaceutical company hands out awards for innovations in pain management. A group of enthusiastic doctors of a pain clinic in Hull (UK) filed a rapport at the Grünenthal commission which described the success stories they had with MS patients treated with APS Therapy. The independent commission was impressed and invited the team to proceed with the award procedure. In total 46 teams in the UK were invited to participate in the race. Maurice Uytdewilligen and Madelène Uytdewilligen (Management of APS Therapy 1st en 2nd from left), together with the 3 British doctors from Hull. Nowadays APS Therapy trains more and more doctors all over the world in the use of APS Therapy, also this group of doctors which initiated the success of the “Grünenthal pain and commissioning award”. “However most of the APS Therapy machines that we manufacture go to private users we see a growing interest from the area of doctors and professional therapists to include APS Therapy in their clinic” says Maurice. This award offers us new possibilities for APS Therapy to conduct further research and continue the development. “This award increased the interest even more. If an independent commission of 5 experts in the field of pain management gives you this award, that means something” says Madelène Uytdewilligen, director of APS Therapy. She continues: “But what is really important is that this publicity and recognition brings the therapy closer to the people that need improvement of quality of life that can be provided with the APS Therapy. That what this is all about. In this regard I want to repeat the words spoken by the managing director of Grünenthal during the award ceremony”.